Background: 2-hydroxyethyl methacrylate (HEMA) is a resin-based methacrylate material most widely used as an adhesive within dentistry. In order to reduce the level of HEMA toxicity, some ingredients such as water, ethanol, and acetone are used as solvent agents because they are readily available and inexpensive. However, significant concerns persist with regard to their biocompatibility. Purpose: The aim of this study was to compare and evaluate the biocompatibility of HEMA, HEMA with water solvent, HEMA with ethanol solvent, and HEMA with acetone solvent by measuring the oxidative stress parameters of malondialdehyde (MDA). Materials and Methods: Twenty-seven Wistar rats were equally divided into three groups. Three dental resin-based adhesive systems were subsequently applied to the dentin surface of their teeth. MDA assessment was conducted based on the levels of MDA expressions observable under microscope 24 h after initiation of the treatment. 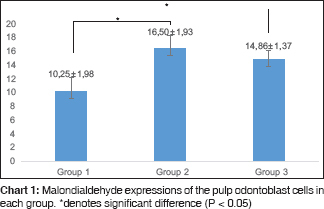 Results: There was a significant difference in MDA expression in the pulp odontoblast cells between Group 1 and Group 2 with a P = 0.000. Similarly, there was a significant difference in MDA expression in the pulp odontoblast cells between Group 1 and Group 3 with a = 0.000. Yet, there was no significant difference in MDA expression in the pulp odontoblast cells between Group 2 and Group 3 with a P = 0.082. Conclusion: HEMA with water solvent showed the least MDA expression compared to HEMA with ethanol and water solvent, therefore, HEMA with water solvent has the most suitable biocompatibility. The increased use of direct composite restoration will also increase the application of dentin bonding materials since composite resins cannot bind chemically with the hard tissue of the teeth. Thus, some form of dentin bonding material is required. In fact, numerous forms of commercial dentin bonding are currently commercially available for clinical use. The application of dentine bonding materials has even undergone a rapid revolution indicated by the abundance of adhesive materials on the market at present. Nevertheless, the selection of dentine bonding materials should take into account certain factors regarding long-term clinical success, such as attachment strength and material biocompatibility. To evaluate the biocompatibility of the material before clinical usage, some initial tests, such as a mutagenesis test and an in vitro toxicity test, should be performed. These should be then followed by a toxicity reaction test of intraosseous and subcutaneous implantation in experimental subjects and subsequently, a safety test for human use. 2-hydroxyethyl methacrylate (HEMA) is one of the most common monomer components in dentin bonding compositions. The concentration of HEMA present in modern dentin bonding materials is 35%–50% which is intended to reduce viscosity, prevent collagen collapse, and increase attachment strength. However, HEMA has weaknesses that affect odontoblast structure and cell formation activity. According to Spagnuolo et al., the results of biological tests on HEMA-based dentin bonding materials show that the detached HEMA monomer can increase the level of reactive oxidative stress (ROS) that, in turn, may affect cell proliferation and defense leading to cell damage. One response of fibroblast cells to ROS formation by HEMA is NF-kB activation. This metabolic process can also provoke cells to generate excessive intracellular ROS, such as hydrogen peroxide (H2O2), superoxide radicals (O2*), and hydroxyl radicals (OH*), known as free radicals. These free radicals will then modify and destroy carbohydrates, proteins, lipids, and nucleotides in tissues, while also being capable of destroying cells early in the process of lipid peroxidation resulting in changes to the structure and function of cell membranes. When these free radicals react with lipids, they will also form the product of malondialdehyde (MDA) compounds. Therefore, in order to reduce the toxicity of HEMA, the addition of a solvent is necessary to decrease its concentration. The solvent also acts as a vehicle for delivering HEMA monomer to collagen fibrils, as well as helping to rebuild collagen fibrils when dry aimed at allowing HEMA monomers to adhere to collagen fibrils. In modern dentin bonding materials, water, ethanol, and acetone are the most widely used solvents since they are not only readily available and relatively inexpensive but also possess the lowest toxicity to the body. Water solvent has high hydrogen-bonding capacity, enabling it to be applied to a wide, dry dentine surface, and also demonstrates nonvolatile and stable properties which can extend the life of the wearer. However, the ethanol solvent offers the advantage of having higher evaporation properties compared to those of the water solvent which can help remove excessive water from the adhesive surface. Acetone is a good solvent due to its ability to combine hydrophobic and hydrophilic components. In addition, acetone not only has high evaporative properties but is also about four times less stable than ethanol. Therefore, if acetone is used as a solvent for dentin bonding material, it can accelerate the function dentin bonding material itself. Several previous pieces of research have focused on HEMA induced by ROS. Certainly, there are still few investigations focusing on how the kinds of solvent mixed with HEMA affect the number of MDA expressions. The results of such previous research have revealed that directly measuring free radicals when they are inside tissues is extremely problematic since their reactions are very rapid and unstable. In contrast, the MDA derived from free radical reactions with lipids in lipid peroxidation has a relatively stable structure with the result that measuring MDA expressions inside tissues is considered more accurate. MDA expressions can, thus, be used as a biomarker for measuring oxidative stress. This research constituted an experimental laboratory-based study incorporates a posttest-only control group design. All treatments conducted during this study were in line with the principles of animal laboratory care enacted by the Ethical Committee through certificate no 297/KKEPK. FKG/XII/2016. The samples analyzed were the lower right molars of Wistar rats that had been treated in accordance with the treatment procedures relating to each group. A total of 27 research samples were divided into three groups, namely: Group 1 featuring the application of HEMA + water, Group 2 featuring the application of HEMA + ethanol, and Group 3 featuring the application of HEMA + acetone. The sample size of each treatment group was calculated using a Federer formula. The material used in this research was pure HEMA with a concentration of 97% reduced to 10% by adding phosphate-buffered solution (PBS) solution with a morality formula of M1 × V1 = M2 × V2. This means that the amount of HEMA obtained at a concentration of 10% was 1 ml. It was then mixed with a certain solvent based on the specific treatment relevant to each group, at a ratio of V: V (35%:65%). In Group 1, HEMA was mixed with distilled water, while in Group 2, HEMA was mixed with 99% ethanol and in Group 3 HEMA with 99% acetone. Each Wistar rat was subsequently anesthetized intramuscularly with an injected dose of 0.2 cc derived from a mixture of 0.5 cc ketamine and 0.5 cc xylazine base (Pfizer, Reg. DKL0319807843A1). Then, the lower right first molar crown was disinfected and cleaned with a cotton roll previously dipped in a 70% alcohol solution. Tooth cavity preparation was conducted by means of a low-speed handpiece (NSK, Japan) with a round diamond bur no 0.12 (Dental Burs Australia, Australia) on the central fossa with a diameter of 1 mm and a depth of 1.5 mm. Previously, the bur had been fitted with a stopper 1.5 mm in height, followed by straight fissure bur (Dental Burs Australia, Australia) to dilate the cavity to a diameter of 2 mm without causing pulp perforation. To examine the existence of pulp perforation, fine paper point was used to detect the bleeding. After preparation, the cavities were irrigated with sterile saline solution before being carefully dried with sterile cotton rolls. At this depth, the dentin tubule would be exposed without opening the pulp roof so as to avoid bacterial contamination (noninvasive method) leading to an acute inflammatory response. HEMA with ethanol, water, and acetone solvent were applied on the tooth of each group using microbrush, respectively. After 24 h, while anesthetized, the rats were sacrificed by having their aorta cut. Thereafter, their right lower molar together with a section of jaw approximately 12 mm in length was excised to be used as a specimen. The teeth were decalcified using EDTA and sliced 5 μm by means of rotary microtome, then mounted on object glass using gelatin 5%. Slides were washed using PBS pH 7.4 for a minute, and hereinafter, the endogenous blocking was performed using H2O23% for 20 min and washed again using PBS three times for 5 min. Unspecified protein blocking was performed using PBS 5% containing 0.25% Triton X-100 and washed using PBS three times for 5 min. Slides were incubated using monoclonal antibody anti-MDA (Abcam, No. Prod ab126288) subsequently for 60 min and washed using PBS three times for 5 min. The slides were then incubated using anti-HRP conjugated for 40 min and washed using PBS three times for 5 min. Drop of diaminobenzene was added and incubated for 10 min and washed using PBS three times for 5 min and H2O for 5 min. Counterstain was performed using hematoxylin Mayer, and slides were mounted using entellan and covered by cover glass. The coloring results were subsequently observed under a light microscope at a magnification of ×400, the cells expressing MDA were counted in three different areas that were randomly chosen. The acquired data were analyzed using one-way ANOVA and Tukey's least significant difference (LSD) in order to compare the two groups. The results of the differentiation of MDA expressions of Wistar rat pulp odontoblast cells after the application of HEMA + water, HEMA + ethanol, and HEMA + acetone are presented in [Chart 1]. The results of the immunohistochemistry examination of MDA expressions of Wistar rat pulp odontoblast cells after the applications of HEMA + water, HEMA + ethanol, and HEMA + acetone are shown in [Figure 1]. Results of the one sample Kolmogorov–-Smirnov test showed a P = 0.403 (P > 0.05), thereby indicating that the distribution of the data was normal. Next, homogeneity test, Levene's test showed P = 0.683 (P > 0.05), indicating the data were homogeneous. One-way ANOVA test then was carried out and showed a P = 0.000 (P < 0.05), demonstrating that there were significant differences among those three groups. A post hoc test and LSD test were subsequently performed to identify the specific differences between each group. The results of the LSD test can be seen in [Chart 1]. The results of the LSD test confirmed a significant difference in MDA expression in the pulp odontoblast cells of Wistar rats between Group 1 (HEMA + water) and Group 2 (HEMA + ethanol) with a P = 0.000 (P < 0.05). Similarly, there was a significant difference in MDA expression in the pulp odontoblast cells of Wistar rats between Group 1 (HEMA + water) and Group 3 (acetone-based HEMA) with a P = 0.000 (P < 0.05). Unlike the previous results, there was no significant difference in MDA expression in the pulp odontoblast cells of Wistar rats between Group 2 (HEMA + ethanol) and Group 3 (HEMA + acetone) with a P = 0.082 (P < 0.05). This research aimed to determine the bioavailability of readily available HEMA in various solvent, based on MDA expression within the odontoblast cell. HEMA is one of the most common monomer components in dentin bonding compositions. A high-quality interface of dentin bonding is achieved when the monomer of the adhesive materials could infiltrate through and encapsulate exposed collagen fibrils. Then, create the resin–dentin interdiffusion zone called “hybrid layer.” Thus, the goal of resin-based dentin bonding system is a complete infiltration of the adhesive materials into the interfibrils spaces, and consequently, encapsulate the collagen fibrils in the entire demineralized dentin. Yet, a previous study stated that biological tests on HEMA-based dentin bonding materials show that the detached HEMA monomer can increase the level of ROS that, in turn, may affect cell proliferation and defense leading to cell damage. The concentration of HEMA present in modern dentin bonding materials is 35%–50% which is intended to reduce viscosity, prevent collagen collapse, and increase attachment strength. However, HEMA has weaknesses that affect odontoblast structure and cell formation activity. 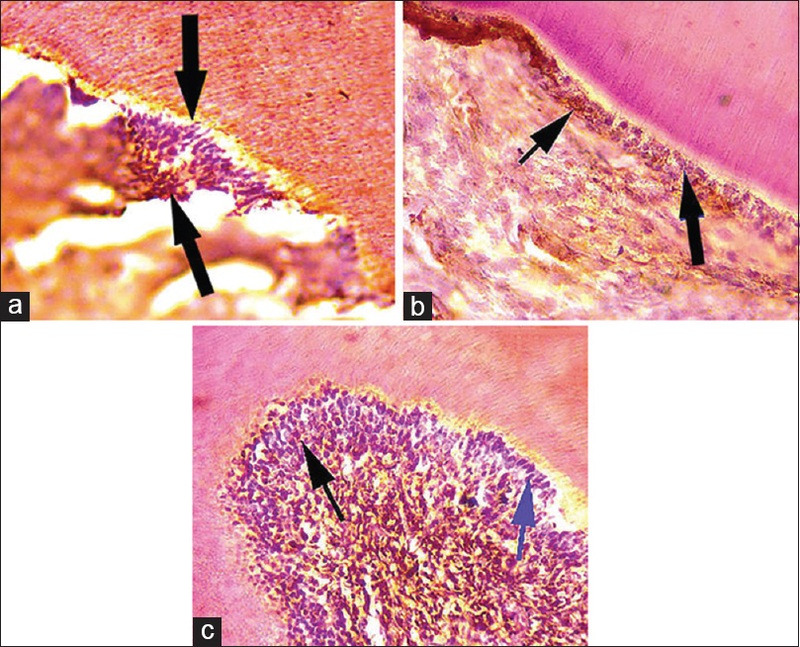 A previous study stated that adhesive materials may lead to pulp inflammation and necrosis, however, the cytotoxic effects of adhesives materials depends on dentin permeability and the residual dentin thickness. The study also stated that HEMA constitutes monomer with lower molecular weight, which showed less toxic effect than the other materials for dentin adhesives. Cell damage as caused by resin-based adhesive material is correlated to type and amount of released residual monomer. The released residual monomer will induce the formation of ROS, which destroy and inhibit the proliferation and defense mechanism of the cell. The metabolism initiate overproduction of intracellular ROS, including radical hydroxyl (OH−) and radical superoxide (O2−). HEMA and its solvent can penetrate plasma membrane of odontoblast through tubulus dentinalis, inducing ROS and produce free radicals. HEMA with water solvent contains one radical hydroxyl (OH−) which may cause oxidative stress when accumulated and cause imbalance of metabolism. Radical hydroxyl can modify and damage polyunsaturated fatty acid (PUFA) in the tissue, an important component of phospholipid composing cell membrane. Metabolism of radical hydroxyl and PUFA produce many forms of aldehyde, alkene, and hydroalkene such as MDA. Result showed that MDA expression of the experimental group 2 (HEMA solved in ethanol) was significantly higher than Group 1 (HEMA solved in water). No significant different was observed between Groups 2 and 3. HEMA solved in ethanol has 2 hydroxyl bonds (OH−) and 1 radical superoxide (O2−). Metabolism process which produces MDA is similar as in HEMA solved with water, only different in term of the number of free radicals interacting with PUFA. HEMA solved with ethanol contains 1 hydroxyl bond (OH−) and 1 radical superoxide (O2−). Metabolism process which produces MDA is similar as in HEMA solved with water or ethanol, but the free radical will produce end product if reacted with PUFA in the process of lipid peroxidation. Radical hydroxyl will break fatty acid chain into toxic compounds and various hydrocarbons which may damage cell membrane and cause cell death. High MDA level also reflects cell vulnerability toward oxidation reaction that damages cell, especially cell membrane. HEMA with water solvent showed the least MDA expression compared to HEMA with ethanol and water solvent; therefore, HEMA with water solvent has the most suitable biocompatibility. The authors would like to thank the Ministry of Health for funding the research. This study was financially supported by the Ministry of Health. Ganjiwale J, Gohil K, Poptani B, Shukla M. Microtensile dentine bond strength of fifth and seventh generation dentin bonding agent after thermocycling: An in-vitro study. Contemp Clin Den 2012;3:167-71. Craig RG. Restorative Dental Materials. 11th ed.. London: Mosby; 2002. p. 57, 69-70, 232-40, 261, 269-70. Cetingüç A, Olmez S, Vural N. HEMA diffusion from dentin bonding agents in young and old primary molars in vitro. Dent Mater 2007;23:302-7. Spagnuolo G, D'Antò V, Cosentino C, Schmalz G, Schweikl H, Rengo S, et al. Effect of N-acetyl-L-cysteine on ROS production and cell death caused by HEMA in human primary gingival fibroblasts. Biomaterials 2006;27:1803-9. Daokar S, Siddiqui S, AlJeaidi Z, Mustafa M, Mapari P, Nadeem F. Assessment of oxidative stress induced by various restorative materials: An in vivo biochemical study. J Int Oral Health 2016;8:670-4. Fontes ST, Fernández MR, Ogliari FA, de Carvalho RV, de Moraes RR, Pinto MB, et al. Tetrahydrofuran as solvent in dental adhesives: Cytotoxicity and dentin bond stability. Clin Oral Investig 2013;17:237-42. Ekambaram M, Yiu C, Matinlinna J. An overview of solvents in resin – Dentin bonding. Int J Adhes Adhes 2015;57:22-33. Sayed H, Mohamad R, Essa M. Marginal seal of water-based formulation of light activated bonding agent for use in combination with adhesive restorations. Dentistry 2015;5:291. Zorba Y, Yildiz M, Yildirim A, Gursan N, Ercan E. Reactions of connective tissue to self-etching/priming dentin bonding systems: Oxidative stress tumor necrosis factor a expression, and tissue reactions. J Dent Sci 2009;4:136-8. Garcia FC, Wang L, Pereira LC, de Andrade e Silva SM, Júnior LM, Carrilho MR, et al. Influences of surface and solvent on retention of HEMA/mixture components after evaporation. J Dent 2010;38:44-9. Chung MK, Lee J, Duraes G, Ro JY. Lipopolysaccharide-induced pulpitis up-regulates TRPV1 in trigeminal ganglia. J Dent Res 2011;90:1103-7. Pallavi S, Rajni N, Shashi PT, Udai PS, Naveen M. Adhesion to pulp chamber dentin: Effect of ethanol – Wet bonding technique and proanthocyanidins application. Saudi Endod J 2015;5:38-44. Lazia T, Rosana S, Inggrid R, Jose G, Eduardo M, Jose M. Cytotoxicity of current adhesive systems:in vitro testing on cell culture of L929 and balb/c 3T3 fibroblasts. Rev Odontol Ciênc. 2009;24:129-34. Szczepanska J, Poplawski T, Synowiec E, Pawlowska E, Chojnacki CJ, Chojnacki J, et al. 2-hydroxylethyl methacrylate (HEMA), a tooth restoration component, exerts its genotoxic effects in human gingival fibroblasts trough methacrylic acid, an immediate product of its degradation. Mol Biol Rep 2012;39:1561-74. Samuelsen JT, Dahl JE, Karlsson S, Morisbak E, Becher R. Apoptosis induced by the monomers HEMA and TEGDMA involves formation of ROS and differential activation of the MAP-kinases p38, JNK and ERK. Dent Mater 2007;23:34-9. Winarsi H. Antioksidan Alami Dan Radikal Bebas. Kanisius, Yogyakarta: Kanisius 2007; p. 50-5.